Donald Soniat, an 11th grade student at Walter L. Cohen College Prep, won first place in the Camellia Club of New Orleans' inaugural art competition. Donald was recognized by the Orleans Parish School Board (OPSB) and the Camellia Club at OPSB's March meeting. 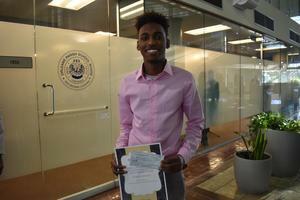 Donald's winning artwork is currently on display at Delgado Community College.